Terminix and kid’s museums seem like an odd combination at first. But upon closer inspection (pun intended), they’re a perfect pair. Most kids are fascinated by bugs. And, where there are children, there are family decision-makers. On the heels of a successful museum tour started in 2008, Terminix has hit the road again this year with the help of a new technology. Thanks to touch-based photo activation, the company has been able to reduce its staff, cut costs and increase consumer throughput during high volume days, like Saturdays, when it churns out an average of 400 photos in eight hours. Dubbed Harry’s Big Adventure: My Bug World, the tour sprung from Terminix’s presenting sponsorship in 2008 of the grand opening of the New Orleans-based Audubon Insectarium, the only insect museum in the country (Harry is a Chinese praying mantis and the tour’s mascot). From there, Terminix decided it wanted to further educate consumers about the role insects play in our environment, as well as the value of ridding them from our homes. So, it went on a week long tour to science museums and children’s centers from Memphis to New Orleans where it introduced Harry to the public for the first time. The tour included an insect petting zoo and a bug chef who whipped up specialties like scorpion scaloppini and cricket orzo (sounds gross, but the kids loved it). Happy with the results, Terminix hit the road for an additional three weeks visiting museums across the southeast with more activities like roach races and cricket spitting contests. 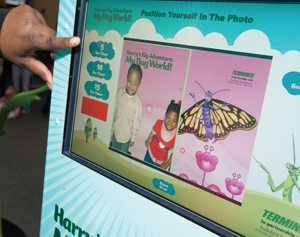 To continue generating customer leads, Terminix embellished the tour creating a 3,500-square-foot mobile insect museum launched on Feb. 12 and on reserve for four months at the Memphis Children’s Museum with negotiations for stops in Arkansas, California and Texas. The new tour retains most of the original tour’s elements, but has added interactive bug habitats like forests, meadows, water and more. There’s a model home where kids can go in and put on a Terminix technician’s jacket and hard hat, take a clipboard and inspect the home for pests, like roaches under the sink and spiders in the corners. For data collection, Terminix uses a self-serve touch-based photo kiosk with different “Harry” themed backdrop options. After picking their backdrop, visitors stand in front of the camera and pose during the countdown before the photo is taken. Families preview and adjust the photo before printing, emailing it to themselves or sharing it on Facebook, MySpace and Twitter. Once they retrieve the photo on a Terminix branded microsite (2,000 have been taken so far) they are asked to fill out a survey and opt in to receive a free home inspection. 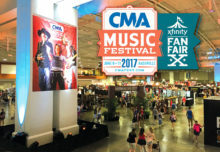 A second touch-based kiosk with promo materials is on hand to collect data from those that don’t want to take a picture (Agency: Smash Experiential, Memphis; Photo Activation: Catch the Moment, Houston). The tour also drives families to harrysbigadventure.com to read Harry’s blog, play games and activities, find curriculum guides and request a free classroom visit by a Terminix entomologist and an insect petting zoo. In the front of the bus, two media walls demoed 250 Guard jobs at the touch of a finger. Then visitors were provided with helmets and Kevlar vests and directed to the four additional media walls at the back of the bus where a red light suddenly went off signaling a national disaster had just occurred. 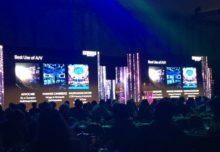 Participants were then allowed to role-play in four, four-minute interactive touch-screen video games in an effort to save the day. Because it’s targeting 17- to 24-year olds who have grown up with cutting-edge technology, it’s important that the National Guard interacts with this demo using the latest gizmos and gadgets.